Put yeast, warm water and 1 tsp. sugar into a measuring cup until dissolved. Set aside and let proof. Place warm milk, sugar, salt, eggs and melted butter into the bowl of your mixer. Start to mix. Add the proofed yeast mixture. Slowly add the flour until well combined. Knead for 8 minutes until dough is smooth and elastic. Place in well oiled bowl and let rest until dough is doubled in size or overnight. Divide into two parts and roll each into a long rectangle. 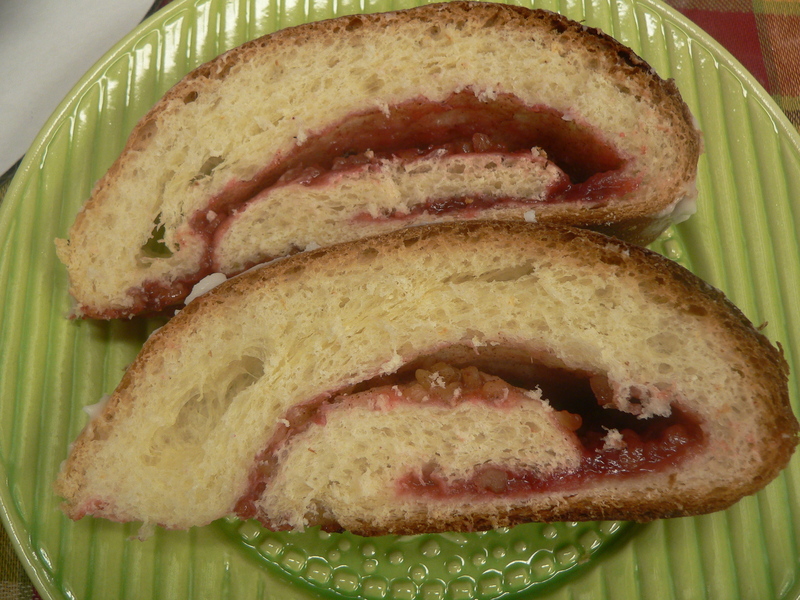 Spread with softened butter and generously with jam. Sprinkle with the nuts and top with the sugar mixed with cinnamon. Roll up with the filling on the inside and place in a well greased baking sheet, seam side down. Shape each half like a half a horse shoe. Make two cuts on top following the horse shoe shaping. As the dough rises it will spread open. Let rise until doubled or overnight. Bake in a preheated 375 degree oven for 35 minutes. Cover with foil close to the last so that it does not over brown. Drizzle with icing made by stirring a little cream into powdered sugar and flavored with almond or vanilla extract. *Recipe Notes: “I have been making this since 1975. Always a family favorite and I usually start in the AM, then roll out later in the afternoon and bake in time for breakfast the next day. 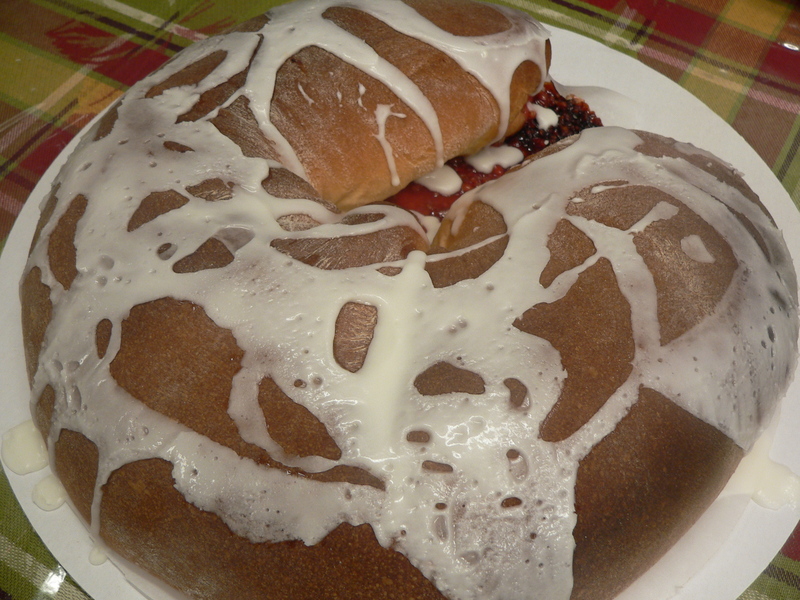 I also shape it in a 12 inch cake pan and use parchment paper instead of a greased sheet. All you need now is a great cup of coffee! Thank you Pam! Pam stopped by and surprised us with a beautiful Danish Coffee Cake and it was delicious! Thanks so much for sharing this recipe!